Cachet Financial Solutions’ mobile money platform to support Check Into Cash’s U.S. Money Prepaid MasterCard. P2P lender Landbay deploys Netverify from Jumio. Blackhawk Network adds exchange functionality to its digital services platform. Azimo celebrates World Money Transfer Day with zero fees promotion. Fenergo enhances its Regulatory Rules Engine technology. FinovateSpring Very Early Bird ticket deadline is tomorrow, March 6. Get your ticket today and save. PYMNTS breaks down PayPal CEO speech. StockTwits adds support to actively point out evidence of potential stock manipulation. Built in Chicago features Bolstr’s growth and future plans. Since its launch in 2011 Bolstr has been on a mission to offer a simple way for small businesses to get financing quickly. It began lending in 2013 and since then, the 1,000+ investors on its platform have delivered $1 million to more than 12 companies. 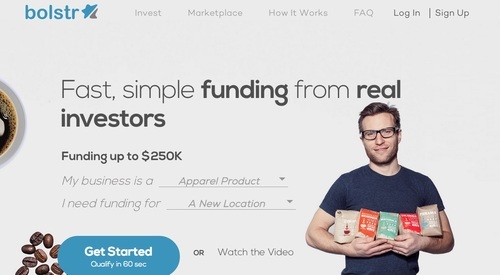 The Chicago-based startup pulled in its first round of funding yesterday. The $1.7 million comes from Montage Ventures, Kapor Capital, DRW Trading Group, Merrick Ventures, and Wilson, Sonsini, Goodrich & Rosati. Bolstr will use the funding to add to its six-person team and scale the platform. It aims to host 15 to 20 deals per month by the end of this year (it did not disclose its current volume). On the Bolstr platform, accredited investors contribute to small business’ funding campaigns, which range from $25,000 to $500,000. The businesses have 30 days to reach their target amount, but since launch, every campaign has reached its goal within five days. Businesses retain full ownership and pay investors back over 12 to 36 months, depending on the agreed-upon revenue share. So far, there have been zero defaults. Bolstr debuted its platform at FinovateFall 2012 in New York. Monitise announces digital commerce and resourcing alliance with IBM. ThinkAdvisor takes a look at the deal between the San Francisco 49ers football team and Wealthfront. The Globe and Mail profiles David Lloyd and IntelliResponse as part of its Innovators at Work contest. ValueWalk: FutureAdvisor can be used as a free tool to rate your own investment decisions or a low-cost asset management service. Chicago Tribune’s Blue Sky Innovation visits Bolstr for video interview. Bill.com CEO and co-founder Rene Lacerte writes about the “new sharing economy” for Inc.com. CashStar announces spot in Inc 500|5000 for a second year in a row. EyeVerify opens new offices to accommodate recent growth. Locaid partners with Danal to leverage location services in fight against financial fraud. Wallaby Financial named finalist in Samsung Gear App Challenge 2014. ZDNet: Xero continues march into U.S., launches partner marketplace. The Independent looks at how BehavioSec uses behavioral biometrics. Netbanker looks at the effect Apple’s TouchID will have on fintech companies, including Mint and CardFlight. ValidSoft featured in Speech and Voice Recognition White Paper and recognized as a global leaders in voice biometrics. Bolstr co-founders Larry Baker and Charlie Tribbett named to Techweek 100. Arroweye Solutions partners with Caledonian Global Financial Services to provide digital on-demand debit card production. Former Visa executive Elizabeth Buse joins Monitise as co-CEO. New $4 Million Investment for fastacash to help drive growth, product development.